Visually appealing, comfortable to play and capable of great sounds, the Esprit I has much to offer the most discerning of bass players, and even comes with a deluxe gigbag. Overall design and great build quality. The pickup and Vari-coil control. With this pickup and a price £100 cheaper than the previous Blue Label version, it's hard to fault. 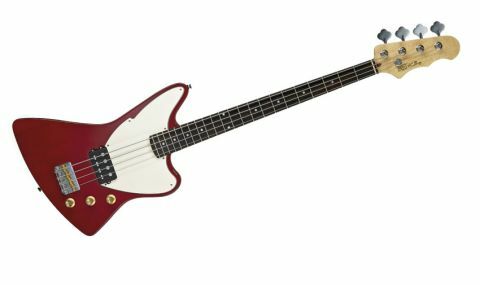 This latest model in the Fret-King bass portfolio, the Espirit I, would surely have appealed to John Entwistle - it's not a million miles away from his infamous Fenderbird amalgamations! "The pickup works like a dream: clean and jazzy when wound back, full and punchy when humbucking"
It sports a great offset look, and an oversized scratchplate that takes the eye directly to the heart of this bass: the stunning new WJM pickup, designed, of course, by Mr Wilkinson. This is a fabulous-looking instrument, and it's medium weight with a keenly contoured and honed satin-feel maple neck bolted onto an agathis body. The surface-mounted controls, chrome-finished WBBC bridge and open-gear tuners all contribute to this stylishly vintage-like persona. "The pickup is basically a Music Man-style coil added to a Jazz-style, coupled together as a humbucker and wired down as a Vari-coil," Trevor tells us. "Turn the Vari-coil back and the MM factor is lost into a Jazz sound, but when it's wound back up as a humbucker it takes on the aspects of the Music Man: fat but focused." With controls for volume, tone and Vari-coil, the pickup works like a dream, producing distinct aspects of both basses: clean and jazzy when wound back but full and punchy when humbucking, giving a unique sound.